Frances Elizabeth (Beth) Flint was born on her father's homestead in the Lower Beaverlodge District on January 1, 1920. She had two older sisters, Pauline and Madelon. Her father, Victor Carman Flint, and his brother George Vincent Flint, ages 18 and 22, were born and raised in Ontario,and came west with the "Bull Outfit" in 1909, followed in 1910 by their parents, Paul & Jane Elizabeth (Kells) Flint. Beth’s mother, Frances Melissa Sills first came to the area in 1911, returned to Ontario, but came back to the Lower Beaverlodge District in February, 1915 as Victor's bride. Beth received her elementary schooling in the one-room Lower Beaverlodge School, the second school in the south Peace area. She attended high school at Beaverlodge. While attending high school, Beth was introduced to Canadian Girls in Training (CGIT) by her teacher. Her interest continued when she went to Toronto, where she formed a group in the church she attended, and later in Clairmont, as well as being a leader at two summer CGIT camps held at Lake Saskatoon, and instructing in handicrafts at CGIT rallies in Beaverlodge and Grande Prairie. She went on to Alberta College in Edmonton for a secretarial course. From 1939-1942 she worked in offices in Toronto and Muskoka Lakes, returning to the Peace Country for Christmas 1942. After 10 months working in a Sexsmith office, on October 20, 1943, she married Everett Axel Sheehan, who farmed with his father on the south side of Clairmont lake. He and Beth bought Elmer Kline's homestead in the same area and started farming on their own. Involvement in the communities of the south Peace has been extensive over Beth's lifetime, and her research, writing and photographic skills are a consistent thread throughout. She is well-known as Clairmont’s historian and the author of "Turn Back the Pages", a history of Clairmont from 1908-1992, but she has been a major contributor to other publications as well. With her sister, Madelon Flint Truax, she co-authored "People of the Pass" a book on the construction of the Monkman Pass Highway--the highway that was never completed. It was hoped it would be a much needed shortcut to shipping ports in Vancouver, British Columbia. 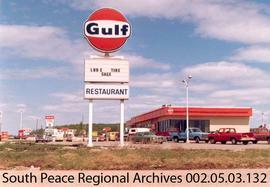 Her editing and photography skills helped produce "Grande Prairie" by J.G. MacGregor. She also contributed to "Beaverlodge to the Rockies" and "Pioneers of the Peace". She is a life member of the Grande Prairie & District Oldtimers Association. Beth was an early champion for the conservation of the Trumpeter Swan, from the 1940s when she saw a pair nesting on Clairmont Lake. This interested her in becoming a life-long member and later a board member of the International Trumpeter Swan Society. During this time two of their conferences were held in Grande Prairie, and she also compiled two brochures on the local Trumpeter Swans for public distribution, under the sponsorship of the Grande Prairie Chamber of Commerce and Muskoseepi Park. As a charter member and a life member of the Grande Prairie Agricultural Society, formed in 1950, over the years Beth served as the secretary-treasurer, and convener at various times of Plants and Flowers, Fine Arts, Photography, and Handicrafts, as well as a long-time board member. Beth’s photographs of the county fair and parade span the years from 1954 to the present. Her collection of historical information on the local fairs dates back to 1910, when the first fair in Grande was held in the vicinity of 101 Street and 101 Avenue. The information becomes more comprehensive with the formation of the 1951 Agricultural Society. The first Home & School Association at Harry Balfour School was organized by Mrs. Sheehan. She also established the first Regional Home and School Association in the south Peace and was the regional director for several years, lastly serving as editor of the “Alberta Home & School News” from 1964-1965. Beth Flint Sheehan was the first office secretary for the St. Paul's United Church in Grande Prairie, and editor of their newsletter, “St. Paul’s Calls,” from 1958 to 1961, also two editions of "... And We Come After", the history of the McQueen Presbyterian Church, whose congreation later formed St. Paul’s United Church and Forbes Presbyterian Church. These books were published in 1961 and 1986 respectively. For six years, Beth was involved with the Alberta Historic Sites Board which dealt mainly with Place Names in Alberta. In 1984 she compiled a brochure for the first North American Hot Air Balloon Championships held at Grande Prairie, and proudly recalls the three hot air balloon rides she had. In 2005, Beth Sheehan received the Alberta Centennial Award. 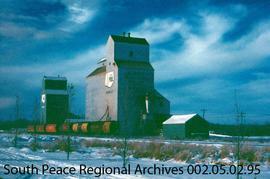 Beth is a source of historical information for many who are interested in the history of the Peace Country. Records donated to the archives by Beth Sheehan in numerous accessions. An accrual of Trumpeter Swans scrapbooks was acquired from the Grande Prairie Public Library in 2009. They had been previously donated to the library by Beth Sheehan. The fonds consists of the following series: personal and family papers and photographs including diaries written by Beth over an extensive period beginning in 1939 (with lapses) and into the 2000s; publications from "The Bull Outfit" with which her father came to the Beaverlodge area 1909; organizational files showing Beth's involvement with Trumpeter Swan preservation, the Home and School Association, the Grande Prairie County Agricultural Society, the Grande Prairie Book Club, and the Grande Prairie Hot Air Balloon Events Association; files relating to her work as author and historian of Clairmont and District, the Monkman Pass, Grande Prairie's 25th Anniversary, Pioneers of the Peace, and the Peace River itself, complete with the diary of a trip down that river in 1955, and a reference system of news clippings on the people and events in the Grande Prairie area from [1970-2000]. There is also a large collection of photographs, both historical and documentary, detailing her activities and showing her interests as a photographer. Other materials include 1623 photographs, 80 negatives, 11 postcards, 12 maps, 12 sound recordings. These records were donated to South Peace Regional Archives by Beth Sheehan in several accessions. Restricted Access to personal diaries for all but direct descendents until 2018.